According to the National Watermelon Promotion Board, only 16 percent of watermelons sold in grocery stores have seeds, down from 42 percent in 2003. In California and the mid-South, home to the country’s biggest watermelon farms, the latest figures are 8 and 13 percent, respectively. The numbers seem destined to tumble. Recently developed hybrids do not need seeded melons for pollination — more on that later — which liberates farmers from growing melons with spit-worthy seeds. ….I decided to do a side-by-side comparison of seeded, seedless, yellow and the newly popular “personal” watermelons from Melissa’s Produce and one seeded melon from a local farmers market. The local melon was the runaway favorite….The runner-up was a seedless personal melon, which was sweet and refreshing but lacked the concentrated flavor of the local melon. Next came the seedless red and yellow melons, which were inoffensive but whose primary asset was being cold on an August afternoon. Bringing up the rear was the California seeded melon, which was mealy and tasteless with more seeds than flesh, though in this case that wasn’t a bad thing. So there you have it. Not only is seeded watermelon hard to find, but it’s hardest to find here in California. My mother is right. 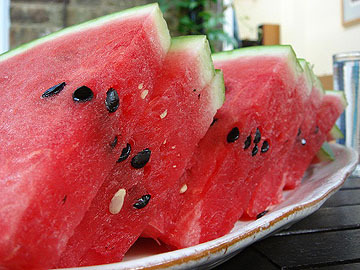 On the other hand, if the California seeded melons are as bad as Black says, maybe that’s not such a bad thing. Still, that just leads to another question: why are California seeded watermelons so terrible? I don’t know, and since I don’t like watermelon in the first place, I don’t have much incentive to find out. But my mother will thank you if you provide an answer in comments.